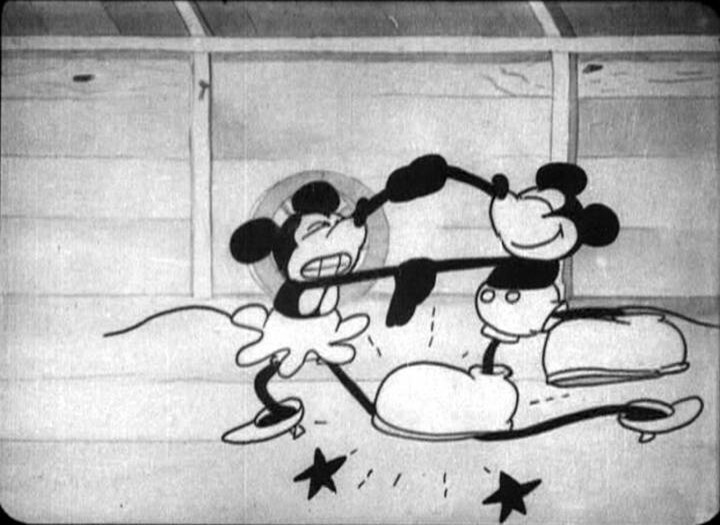 In ‘The Barn Dance’, Mickey Mouse’s fourth cartoon, Pete’s rivaling Mickey for the love of Minnie. The first scene of this cartoon draws its inspiration from the Oswald cartoon ‘Rival Romeos‘, released only eight months earlier. Pete and Mickey both come to Minnie’s house to court her. Pete has the advantage of having a car above Mickey’s chariot, and like Donna Duck would do nine years later in ‘Don Donald‘ (1937), Minnie (wearing a bra, like she did in ‘Gallopin’ Gaucho‘) falls for it. Luckily, the car falls apart even before they’ve taken a ride, so Mickey and Minnie ride together to a barn dance hall. Unfortunately, Mickey can’t dance: his shoes grow bigger every step, stepping on Minnie’s leg all the time. So after the dance Minnie’s leg is a long mess. She then ties it in a knot and cuts off the excess! 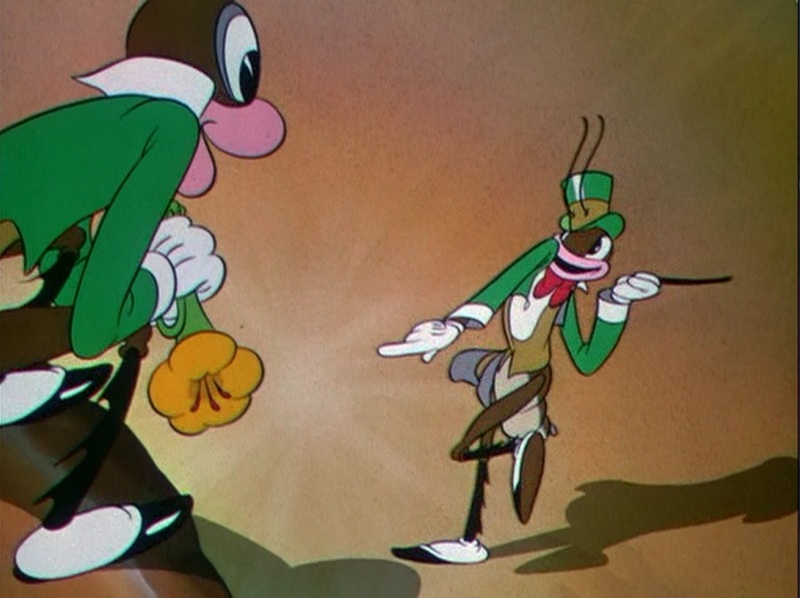 These two gags belong to a surreal type typical of the silent era, which Disney would soon abandon. After Mickey’s failure as a dancer, Minnie only wants to dance with Pete. Mickey solves the problem with help from a balloon, but Pete wrecks Mickey’s plan, regaining Minnie and leaving Mickey crying on the floor. This is a rather odd ending of a marvelous cartoon, which is still firmly rooted in the silent era with its surreal gags, limited use of sound and absence of dialogue. ‘The Barn Dance’ is far less known than the three Mickey Mouse cartoons preceding it, but with its clear storytelling, funny gags and strong acting it’s still a delightful cartoon to watch.